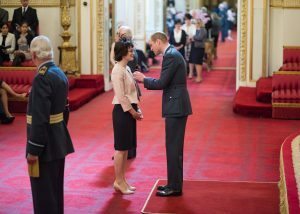 Everyone hates a ‘humble brag’ so I’ll say it straight out – I was chuffed to receive an MBE for services to literature last Tuesday. And here’s why. We live in a time where any sort of intellectual cultural activity is regarded with suspicion, and where funding is being cut from anything that promotes critical thinking. Libraries are being closed, university places are becoming ever more expensive, humanities subjects such as classics are being dropped from school curriculums (their difficulty is having an adverse effect on students’ marks, ‘reasons’ the minister), and where any voice that attempts to express the complexity of life is silenced with cries of ‘elitism’. As we’ve seen in the last two years, this cultural dumbing down has very real effects, and it’s making the world a much darker place for ourselves and our children. I started my life in care. But from an early age I had the good fortune to find books, which in those days were free and in the public library, and which showed me there were possible worlds to which I could aspire. I read voraciously, always. In my early twenties I started working with writing in health and social care. The way poetry allowed people to say the complex, challenging and just plain painful things that couldn’t otherwise be expressed was one of the reasons I was drawn to it. Since then I’ve written, grappled with, and lived with poetry. I’ve tried to serve it in a communal way, setting up festivals and so on: I absolutely love talking about and reviewing books that enthuse me. More and more poetry is seen – and taught – as a simple expression of feelings. For me, it is more than that: it’s an act of resistance, as it points to a notion of being human which is far different from the dumb, complacent and passive consumers that the powers that be wish us to become. Official recognition for work in the cultural sphere is also being hacked away at: one only need compare the number of Honours given for sport compared to literature (don’t even think about looking back thirty years, the change is dramatic). It would of course be great if there was something other than the Queen’s Honours list: but there isn’t. So I accept this honour with all the caveats any thinking person would have, and pledge to keep fighting for a cultural space which allows people genuinely to think, and to aspire to a world where the intellect is seen as valuable both in itself, and in making a world that is, frankly, better than the one we are making now. Well said Fiona! I am, being Irish, no ‘fan’ of all things Empire…but, I couldn’t agree with you more. Well done Fiona & congratulations. You deserve such recognition & you are a true Troubadour of Poetry in these dismal times. All best & all blessings. Rita Rita. do/think acknowledged. Your blog above hits the spot. Spot-on! I don’t expect you can make the Festival this year, but I’m still mentally enjoying your involvement last year. Kim & I are nervously crossing our fingers for another success, not daring to believe it will be as good as last year. Hope to meet up again at some event or other soon. It’s a well-deserved honour. Many, many congratulations! You’ve been contributing tirelessly to enriching the world of poetry. Poetry, only poetry, can make the world better and more peaceful, and the world needs a brilliant poetic voice like you. Wish you achieve more recognitions and honours.